In order for three friends to play together for more than 30 years, there has to be something magical about their musical union. Such is the case with Big Swing Trio. Mark Diamond, Paul Romaine, and Andy Weyl consistently inspire audiences of all kinds with their spirited arrangements of swing, latin, hard-bop, blues, and standard repertoire. Whether they are backing a headliner such as James Moody, captivating listeners at festivals, concerts, or clubs, or creating the perfect party atmosphere at a wedding reception, holiday party, or corporate event, Big Swing Trio knows how to please a crowd. Their high level of talent, professionalism, and enthusiasm combine to make them one of the most sought after trios in the RockyMountain region. Because they have been an integral part of the local jazz community for so long, they are also able to augment their group with the area's best instrumentalists and vocalists in order to create the perfect band for any occasion. They have also been the backing group on many other people's recordings. Call now and find out how you can book this top-quality group for your event! Milestone is a variety band composed of some of the finest musicians in the state. The band is well known for their impressive musicianship and versatility. Whether they are playing the best of Latin Rock, Classic Rock, Rhythm and Blues, Funk, Beatles, Salsa, romantic Bolero, Pop, Jazz or Country, their sound is always authentic to the style, their dancing beats impossible to resist, and their vocals and harmonies hard to beat. Colorado audiences are always amazed to hear this level of musicianship in a "local" band! The standard band line up is a 5 piece band composed of drums, bass/vocal, guitar/vocal, piano/vocal and vocalist/percussionist. They also perform as larger ensembles that include Latin percussion and a horn section. Milestone can perform as a duo or a variety of line ups up to an 11 piece band to suit your budget. The band is equally comfortable performing concerts, corporate events, private parties and weddings and they are sure to make your event unforgettable! 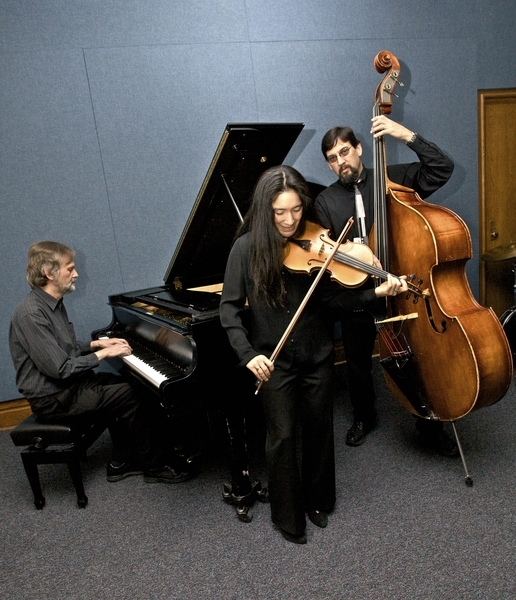 Trio Arrabal is a group featuring Sandra Wong on violin, Andy Weyl on piano, and Mark Diamond on bass. Trio Arrabal got their start at The Tango House and are glad to bring you this music wherever Tango is needed! Los Bohemios is an acoustic ensemble composed of some of the best musicians in Colorado. They play Cuban Son, Salsa, and Boleros (ballads in Spanish with Afro-Cuban rhythms). They also cover other Latin styles such as Bossa Nova, Latin Rock, Latin Jazz and even Mexican Mariachi repertoire. Los Bohemios feature Ricardo Peña on vocals and guitar or requinto, Amy Biondo on vocals and hand percussion, Ed Edwards on guitar and vocals, Mark Diamond on upright bass, and Jose Espino on congas and bongos. 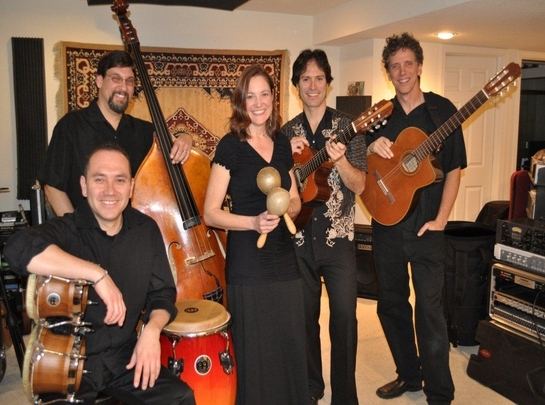 They feature great 3-part harmony, Spanish guitars, acoustic bass and Latin percussion to create danceable salsa rhythms in the style of Buena Vista Social Club or Gloria Estefan, and romantic ballads in the style of Los Panchos. Their impeccable musicianship and diverse repertoire move audiences in concerts, clubs, weddings and private events alike. Many people are discovering and enjoying, thanks to Los Bohemios, the wonderful music of Boleros and Los Panchos (a worldwide music phenomenon of the 40’s and 50’s) and the cultural heritage of Cuban and Latin American music. The band can perform with 3, 4, or 5 people, and also as a larger group, with up to 11 musicians, including full horn and percussion sections! In brief………timeless, fun and beautiful music performed by top notch musicians! Mark first met Lionel Young in 1991 at the Telluride Jazz Festival. They were playing in different bands and struck up a quick friendship. Not long after that they began co-hosting a weekly blues jam in Boulder at The Catacombs, and continue to host a blues jam at the Boulder Outlook Hotel on 2nd and 4th Sundays of the month. Lionel is a one of a kind musician (violinist and singer), and between them they play a multitude of musical styles which they blend into a unique night of music. Featuring a violin and an upright bass in the band, one does not usually expect to hear the deep funk of James Brown, the hard rock of Led Zeppelin, or the classics of Cream, The Beatles, The Allman Brothers, or The Troggs (who did Wild Thing). Their drummer Jay Forrest, is a rock solid drummer and an amazing singer. Coming from Arkansas and raised on gospel and soul music, you can hear his powerful sound in everything he sings. Musically they cover everything from Muddy Waters to Prince, with a bunch of New Orleans grooves, blues, and classic rock mixed in. This band, which can be a three piece to a six piece, is ready to go when you want great music for your wedding, party, nightclub, or concert. It's a band that will get everyone out on the dance floor! !